TGE FT-ICR - Efficient denoising algorithms for large experimental datasets and their applications in Fourier transform ion cyclotron resonance mass spectrometry. Accueil du site > Production scientifique > Efficient denoising algorithms for large experimental datasets and their applications in Fourier transform ion cyclotron resonance mass spectrometry. Efficient denoising algorithms for large experimental datasets and their applications in Fourier transform ion cyclotron resonance mass spectrometry. Modern scientific research produces datasets of increasing size and complexity that require dedicated numerical methods to be processed. In many cases, the analysis of spectroscopic data involves the denoising of raw data before any further processing. Current efficient denoising algorithms require the singular value decomposition of a matrix with a size that scales up as the square of the data length, preventing their use on very large datasets. Taking advantage of recent progress on random projection and probabilistic algorithms, we developed a simple and efficient method for the denoising of very large datasets. Based on the QR decomposition of a matrix randomly sampled from the data, this approach allows a gain of nearly three orders of magnitude in processing time compared with classical singular value decomposition denoising. 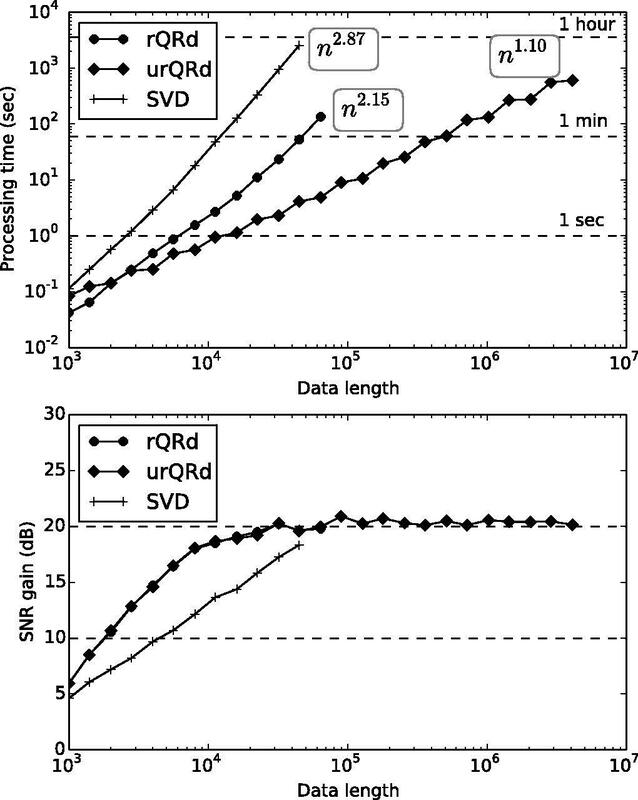 This procedure, called urQRd (uncoiled random QR denoising), strongly reduces the computer memory footprint and allows the denoising algorithm to be applied to virtually unlimited data size. The efficiency of these numerical tools is demonstrated on experimental data from high-resolution broadband Fourier transform ion cyclotron resonance mass spectrometry, which has applications in proteomics and metabolomics. We show that robust denoising is achieved in 2D spectra whose interpretation is severely impaired by scintillation noise. These denoising procedures can be adapted to many other data analysis domains where the size and/or the processing time are crucial.